We’re so excited about the release of our book! Our purpose is to guide you through the process of writing your life story, which can feel like a daunting task. But our years of helping people write and publish their memoirs have taught us how to make this endeavor one of ultimate fulfillment. No matter what joys and sorrows you’ve experienced, you’ll discover the enchantment of unveiling the sweet moments, treasured memories, and unresolved mysteries of your life. 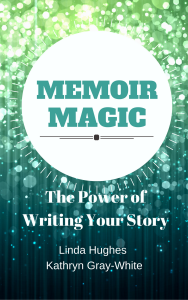 Memoir Magic guides you through the steps of writing your story with easy-to-follow tips and inspirations. We’ll help you sort out all of those pieces of your life and put them into one meaningful memoir. Go ahead; you’ve been thinking about it. Write your story. It will be a magical journey. Abracadabra! Writing your memoir will take you on a magical journey to self-discovery. We’ve never known a memoir writer who hasn’t said they feel changed by the process. Writing a memoir is like slapping your past onto a piece of paper, wrestling it to the ground, coming up in victory, and then giving it away. It’s no longer a battle in your life. You’ve won. It’s over. You can move on. Whether your journey is as gentle as leading to charming remembrances or as profound as leading to life-altering memories, you’re bound to do some soul-searching along the way…. Let Memoir Magic guide you as you pen your story. It’s time to sit down and start writing. This book is also available in paperback, on Amazon.